The four Lok Sabha constituencies of Bihar, where polling is being held in the first of the seven-phase general elections on Thursday, registered 24.57 per cent voter turnout till noon, an election official said. Incidents of poll boycott were reported from some places in Jamui and Nawada constituencies while the police recovered three bombs, including a cane bomb. “Around 24.57 per cent of voting was recorded in the first five hours of polling in four Lok Sabha seats,” Joint Chief Electoral Officer Pravin Kumar Gupta told PTI. The CEO office said 25 per cent turnout was recorded in Nawada Assembly by-poll. Voting at a polling station of Nawada Lok Sabha seat was withheld for some time following the arrest of a polling officer who was found in a drunken state, official sources said. Polling resumed at the booth after he was arrested, the sources said. 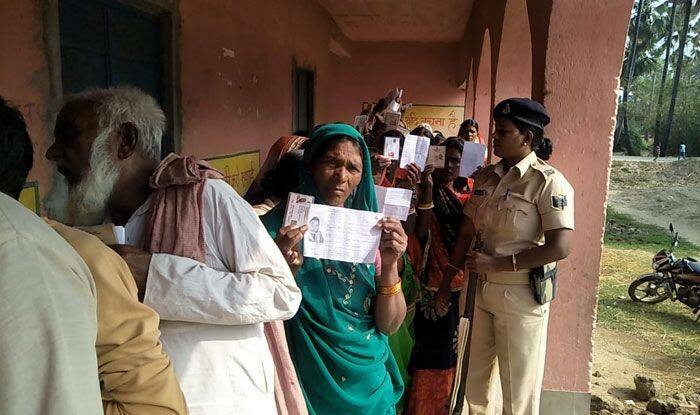 According to reports received from the districts, people boycotted voting at some booths in Jamui and Nawada Lok Sabha constituencies citing non-availability of water and lack of road connectivity in their areas. A cane bomb was found from a polling station in Aurangabad Lok Sabha constituency just before voting began. Two bombs were found beneath Nevta bridge on Imamganj-Raniganj main road falling under Imamganj assembly constituency. The bombs were later defused.